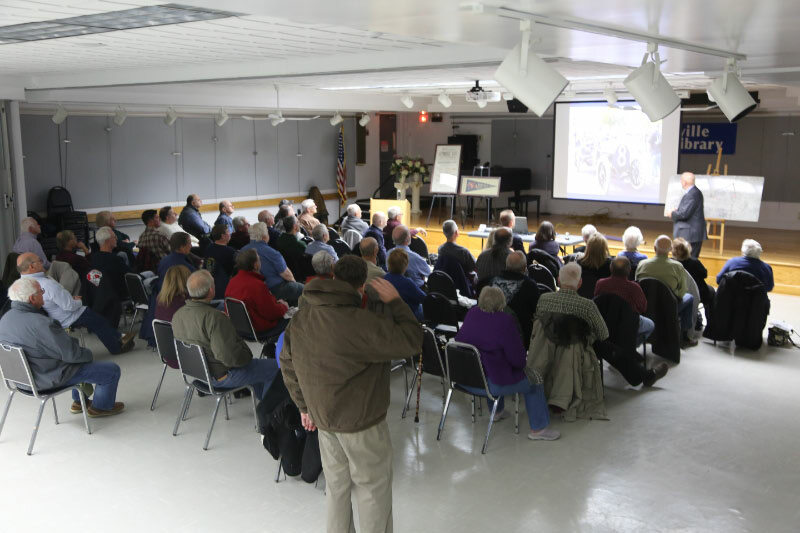 Great turnout for tonight's special "Incredible Vanderbilt Cup Races" presentation highlighting the role of Hicksville in the races. 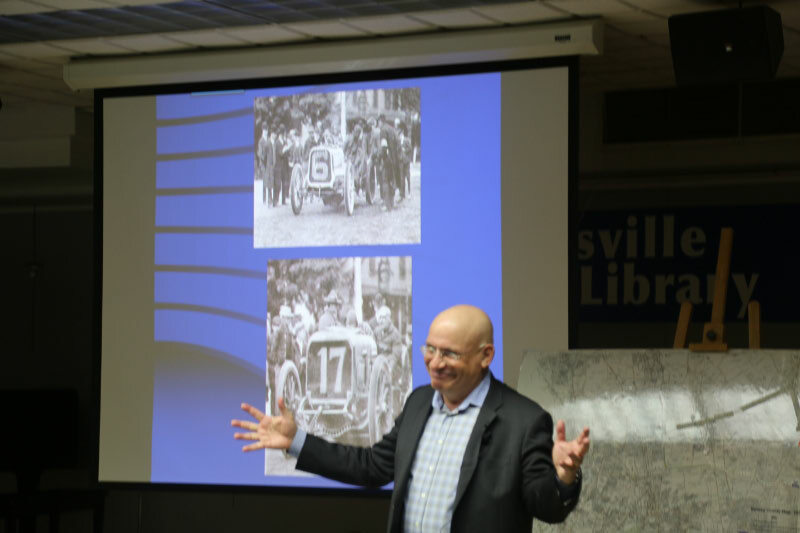 The program was sponsored by the Hicksville Historical Society and held in the Hicksville Public Library within walking distance of the Vanderbilt Cup Race courses for the 1904, 1909 and 1910 races. 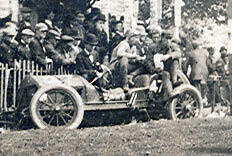 This was part of the 1904 course. 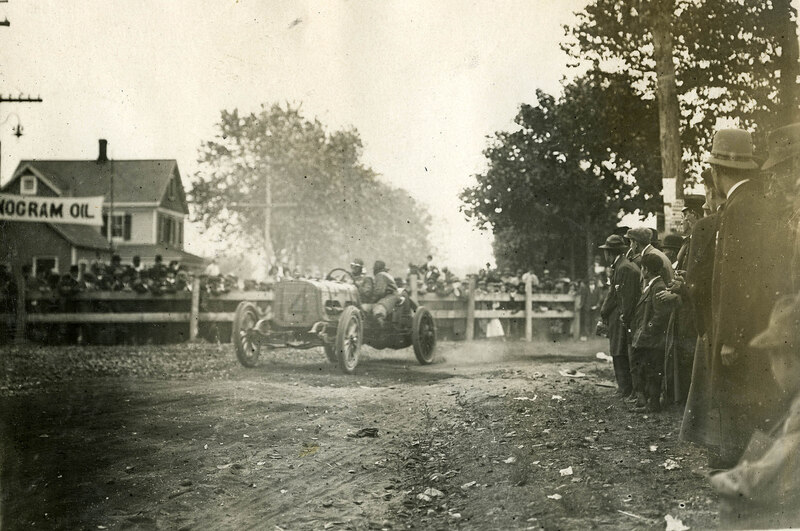 How did the racers circumvent the Long Island Railroad track? 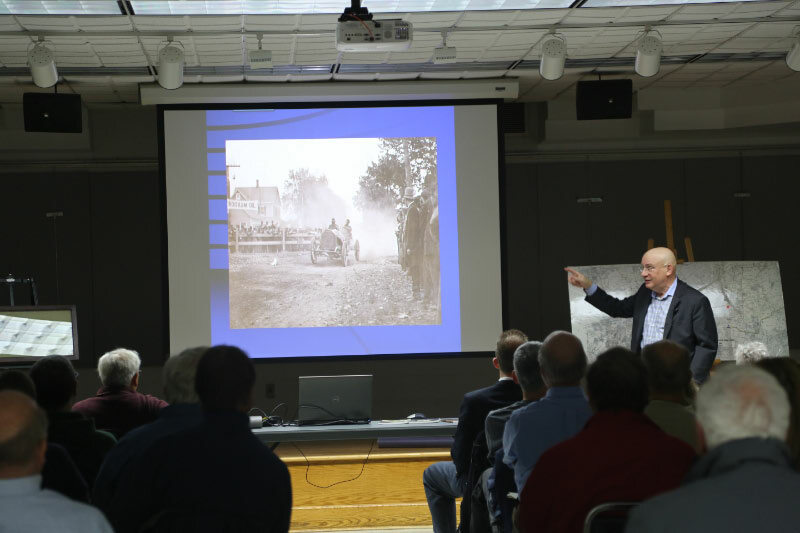 Answer: There was a Hicksville Control where the racers were stopped and then slowed to a crawled for 0.4 mile around the railroad tracks. Identify the still standing Hicksville building on the right. 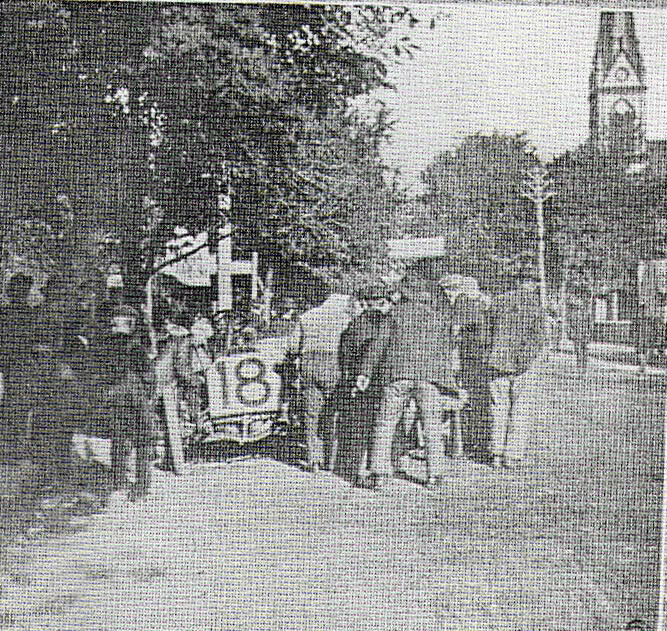 The church was finished in 1891, 13 years before the 1904 race. Why was this racer stopped on Broadway? 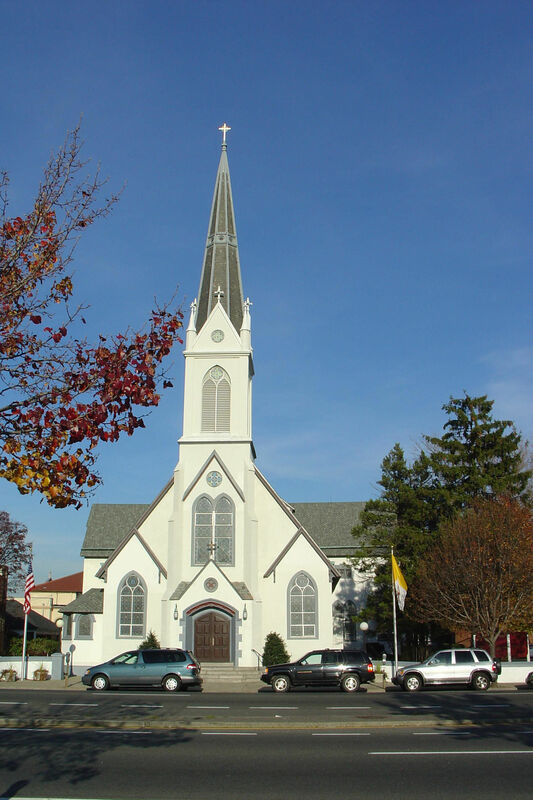 Answer: The #6 Pope-Toledo was stopped at the Hicksville Control. 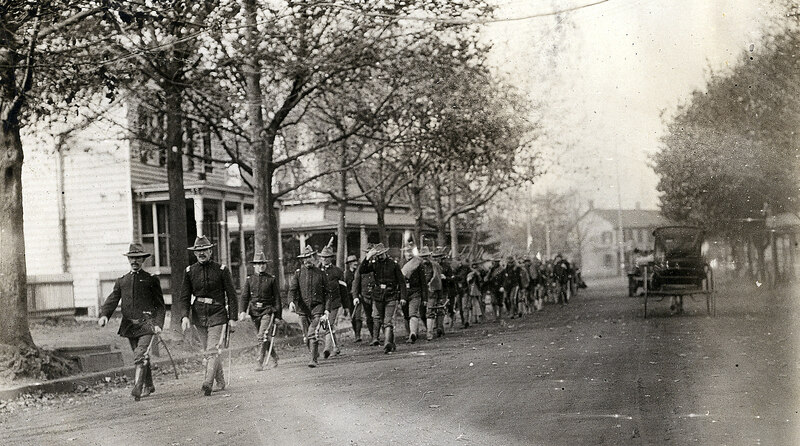 Why were these men marching down Broadway? Answer: The Irish Volunteers hired to control the crowds surrounding the 1908 course. Identify the Hicksville location of the Alco Black Beast. Which of the buildings in the background is still standing? 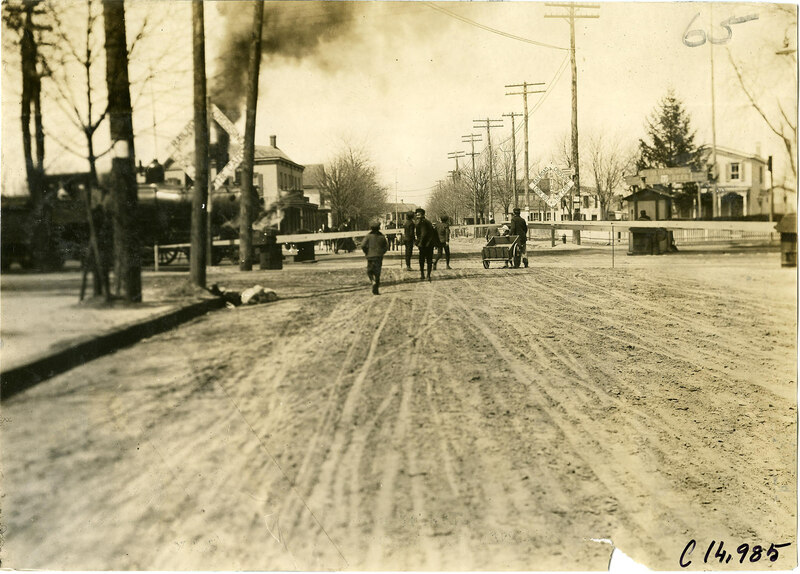 Answer: The view is looking east on Old Country Road, at the intersection with Broadway. 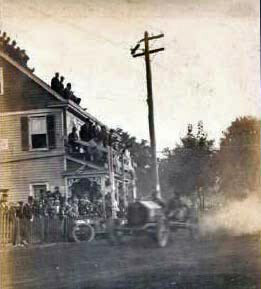 The building to the left of the racer is still standing. Where was the Grand Central Hotel located in Hicksville? 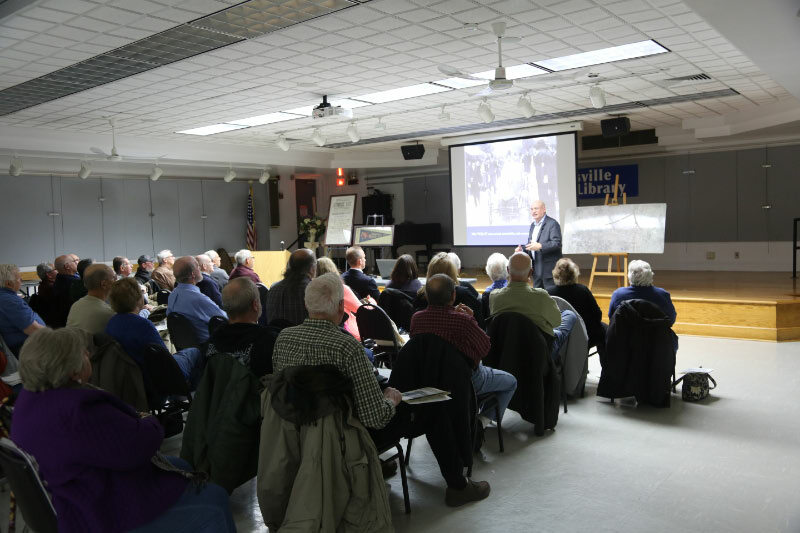 Answer: The Grand Central Hotel was located on Broadway near the Hicksvill railroad station. Why were the spectators rooting for this racer? 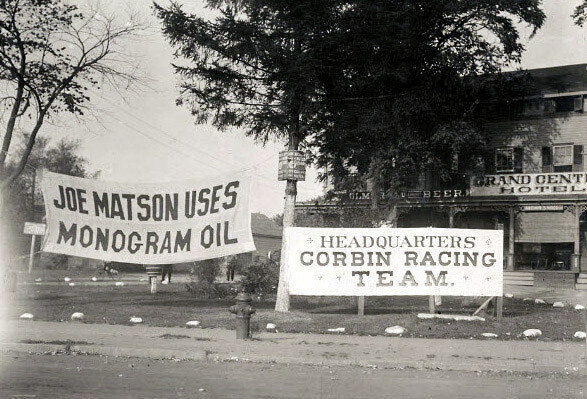 Answer: It was Joe Matson's #14 Corbin who had his headquarters in Hicksville. How did the top of this telegraph pole break during the race? Answer: The telegraph pole was hit by the #47 Mercer driven by W.T. Frey. Another view of the same building. 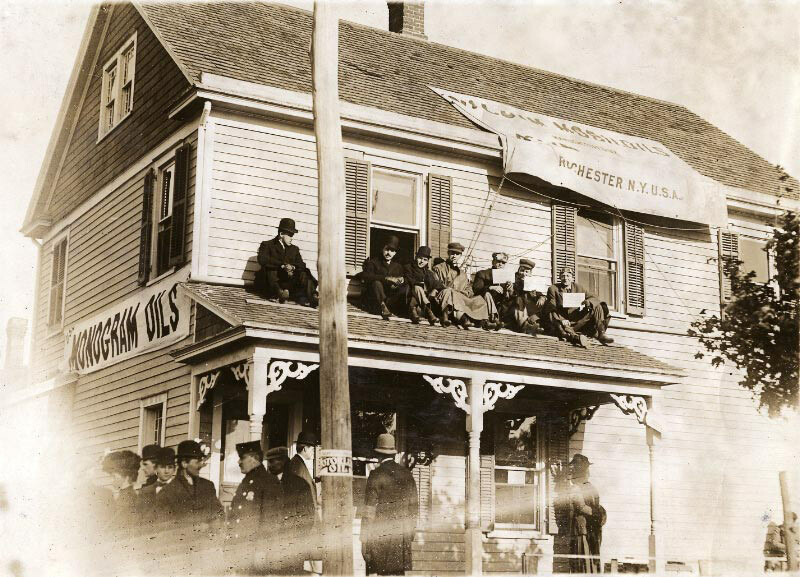 What are the three men on the patio roof on the right likely holding in their hands? Answer: They were likely holding the 1909 Program Guide. 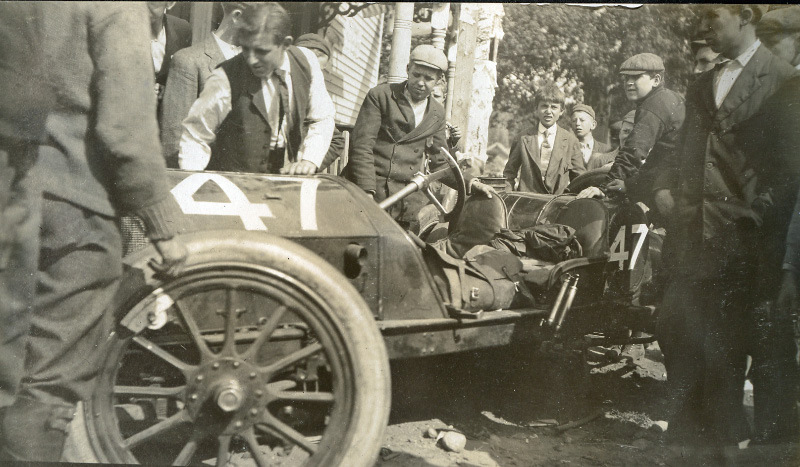 Why are these spectators checking out this racer in front of the building? Who shot this photograph? 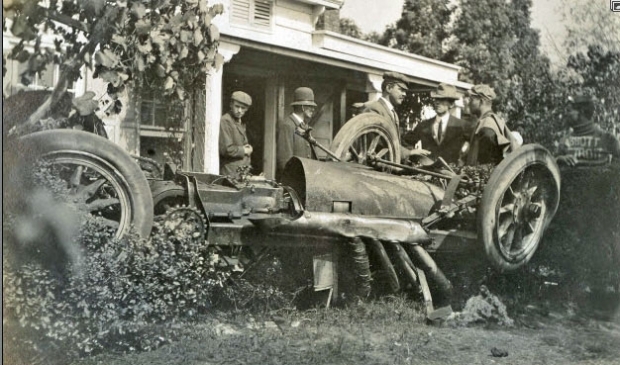 Answer: The photo,taken by Gladys Roosevelt, the second cousin of President Teddy Roosevelt, shows the #47 Mercer after it crashed in Hicksville. 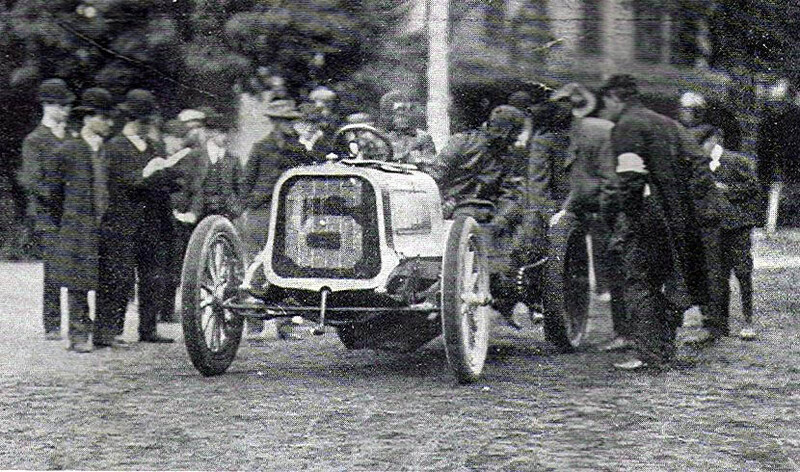 Who was the famous driver of this racer? 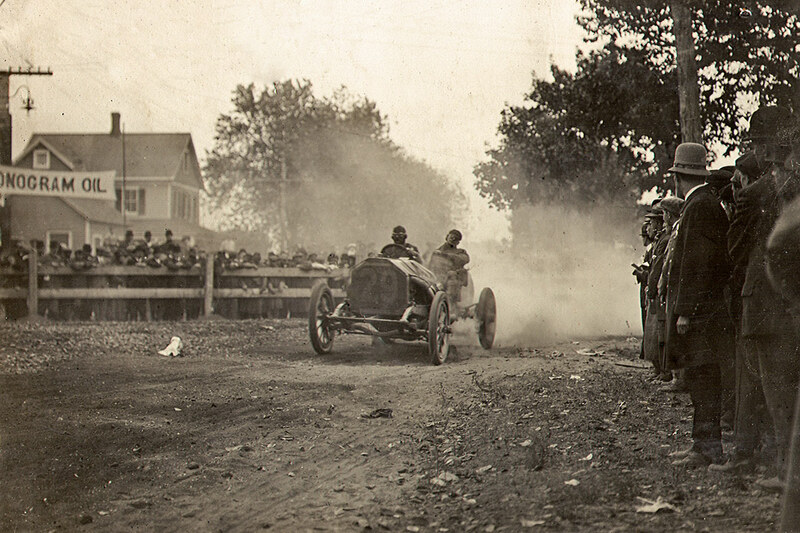 Answer: Louis Chevrolet driving the #29 Marquette-Buick. 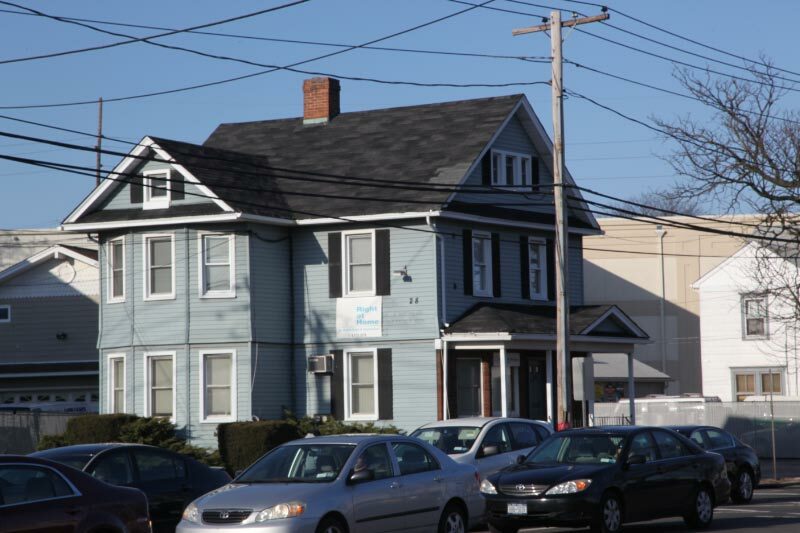 Where did this crash occur in Hicksville? What was its impact on future Vanderbilt Cup Races? Answer: Chevrolet crashed his racer on Old Country Road in Hicksville. 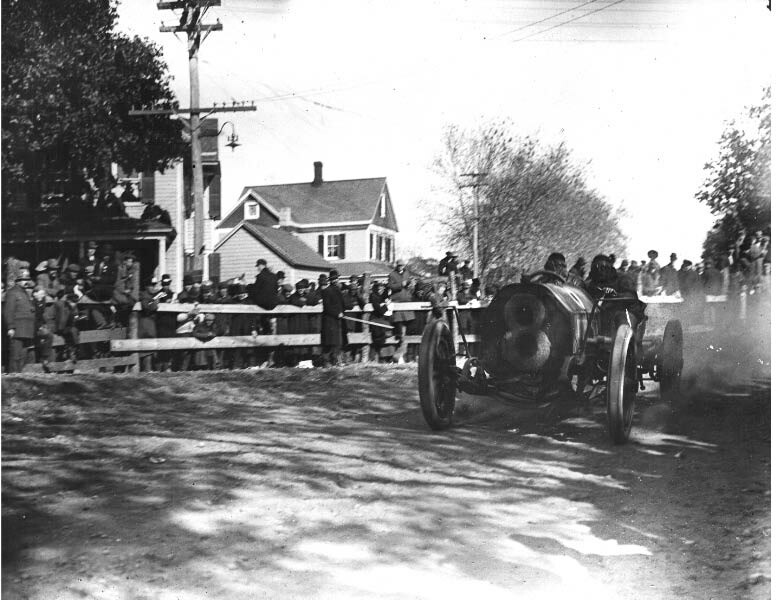 This fatal crash killed his mechanician and helped to place an end to the Vanderbilt Cup Races on Long Island. I sure hope I can make it tonight. If my friend feels up to driving me there. I’ve just discovered this site—Wow! Thank you very much for sharing it with everyone. I have a question about the course for the 1904 Race. From the geometry of the map on the site, I would think that the run through Hicksville followed what today is Jerusalem Avenue, rather than Broadway, which is more nearly parallel to the LIRR tracks to Bethpage. Is that so? If it is, the photo of car No. 18 on Broadway near St. Ignatius Church may depict an off-course practice tune-up, rather than the Race itself. Similarly, the checkpoint caption for the photo of car #6 probably should refer to Jerusalem Avenue, not Broadway. Although I sometimes pick nits (in this case because I grew up right off Jerusalem Avenue), I really do appreciate your efforts. Ron, welcome to VanderbiltCupRaces.com. 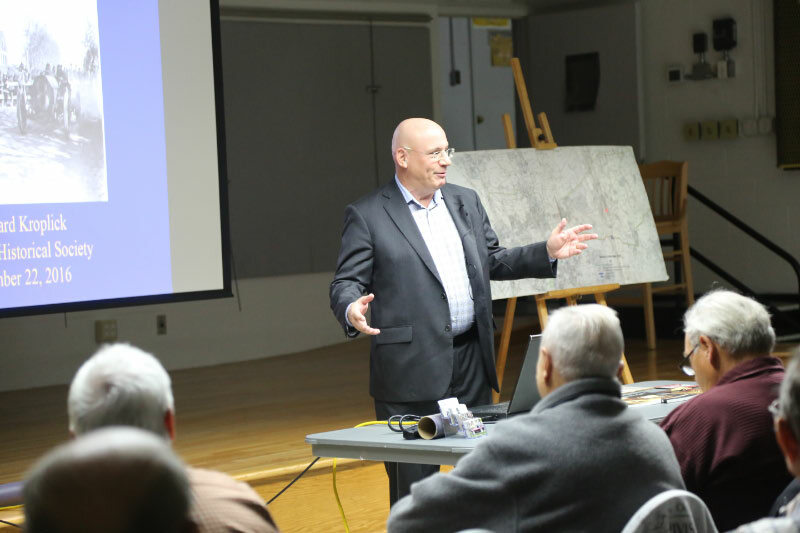 I appreciate your feedback and comments. I will further research the 1904 course.